Comfortable doesn’t have to look sloppy. Semi-attached seat back cushions mean that pillows are sewn onto the sofa back giving you the look of loose pillows without the slouch. This eliminates the need for constant rearrangement of pillows and keeps your living room looking great. 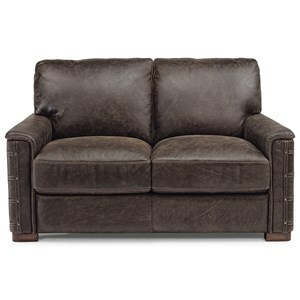 Offering generous plushness that creates the perfect spot to relax, this casual love seat will be perfect for lounging. Soft, fibre-filled back cushions and high-resiliency foam seat cushions pair well with the padded pillow arms to provide comfort while the sectioned back and seat suspension promise support. 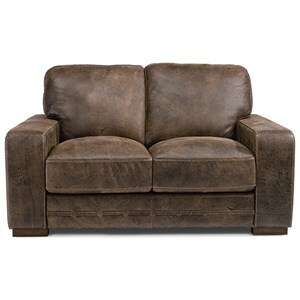 Cover this piece in your choice of fabric or leather by special ordering this piece exactly how you like it. Perfect for relaxing after a long day, this love seat will make a great addition to your home. The Amisk Casual Love Seat with Pillow Arms by Palliser at Reeds Furniture in the Los Angeles, Thousand Oaks, Simi Valley, Agoura Hills, Woodland Hills, California area. Product availability may vary. Contact us for the most current availability on this product. Tailoring Single top stitching for a clean and tailored finish (on leather and select fabrics). Wood & Finish Comes standard with an Espresso finish wood leg. Seat Support Back suspension features 100% premium elastic webbing to provide consistent comfort and support, Seat suspension features interwoven 100% premium elastic webbing, engineered to provide consistent comfort and endurance. Offering pillowy-soft comfort you'll love to sink into to, this living room collection will provide the perfect spots to unwind with family and friends. Each piece features generous padding in the fibre-filled back cushions, high-resiliency foam seat cushions and padded pillow arms for body-hugging comfort. Choose from a variety of seating pieces from sofas to chairs to the perfect sectional configuration to fit your space. To further help you create the living room of your dreams, you can also choose the fabric and feet finish to create a set that fits your personal style perfectly. The Amisk collection is a great option if you are looking for Casual furniture in the Los Angeles, Thousand Oaks, Simi Valley, Agoura Hills, Woodland Hills, California area. Browse other items in the Amisk collection from Reeds Furniture in the Los Angeles, Thousand Oaks, Simi Valley, Agoura Hills, Woodland Hills, California area.